Samsung has published a comparison table that highlights why its Galaxy Note 10.1 tablet that got announced last week at the MWC expo, is better for content creation than Apple's new iPad. The comparison emphasizes the ability to work with two apps at a time, if they support Android's instancing Application Programming Interface (API). The Samsung Galaxy Note 10.1 comes with default Samsung apps that allow having two apps side by side, and any 3rd party app that supports the instancing API can replace Samsung's own app on your tablet's screen as well. The next focal point in the comparison is the stylus, or, to be more precise, the combination of a Wacom digitizer and a pressure sensitive stylus is superior to your average capacitive stylus sold for the iPad. There are some other advantages, according to the Koreans, all of which are listed in the tablet below. Too bad that everyone was expecting a groundbreaking high-res tablet from Samsung, so the undisputable content creation merits of the Galaxy Note 10.1 kind of went unnoticed when people realized it has a standard resolution. Do you agree with Samsung on the content creation front, or do you think that those advantages pale in comparison with the 2048x1356 pixels display on the new iPad? look like Samsung got frightened by the new ipad :D personally I think, These kind of things are useless. . In fact, Samsung points out all the major differences which, unfortunately, the fans of Apple products quite often chose to ignore. The features built in Note 10.1" which offer significant user convenience (require the purchase of an external dongle in the new iPad) are: uSD card slot, built-in micro-USB connector, s-pen support to enable both resistive (precise drawing) and capacitive touch supports. No one can deny the usefulness of uSD card because end-user can increase the storage capacity by up to 32GB easily by simply inserting a $25 card. In contrast, Apple will charge you multiple of this cost. I have no doubt that the GPU in the new iPad has higher performance than that in the Note 10.1". Finally, the rear camera in iPad offers decent picture quality which is better than that of the Note 10.1". But, Samung Note is ostensibly lighter than the new iPad and the lighter weight could mean night & day after holding the device for more than half an hour. 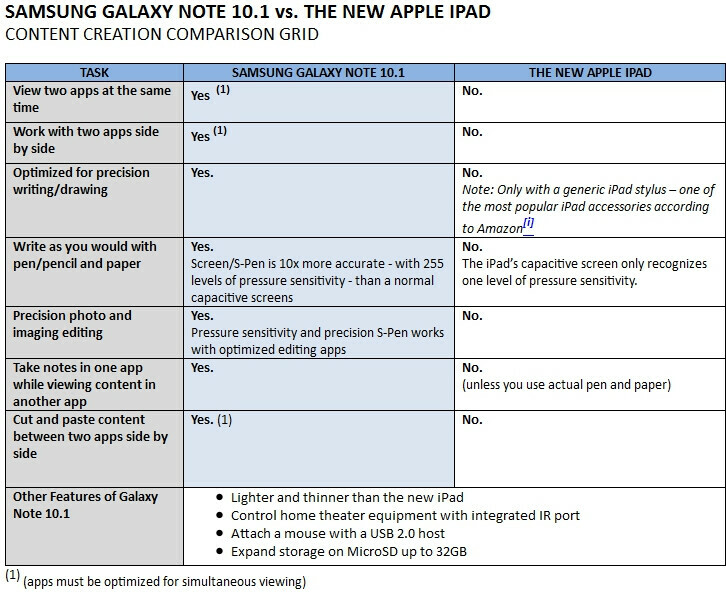 At the end, the different features in the new iPad and Note 10.1" are definitely not useless. Both the new iPad and the Note 10.1" each has its own drawback and plus. At the end, none can claim absolute superiority. Individuals should always pick one in accordance to their needs. Most importantly, consumers should really think hard: does it make sense to spend close to $650 to buy a device which has so many limitation, would the upcoming near ulatrabook size notebook PC offers more value for money? Or, would the ultrabook PC with Win8 that supports both touch & apps and the desktop computing environment be even a better deal because of the all encompassing functions? What part of "content creation" will you do with a 5MP camera?? IMO, a tablet can be shipped with just a FFC. One looks like an a** while using the tablet as a camera. If you want to shoot a pic, use the phone, or a digicam or a DSLR. Side by side apps are wonderful but tell me why I need two photo or video apps side by side when I could have an all in one app that does the same job as two? And this isn't an apple fan comment, this.question refers to Android devices.as.well. Oh you're absolutely right. But Samsung isn't talking productivity. They're talking creativity. I terms to like creativity apps today have the white package. All the features I need in one. So that way I don't need multiple apps. Well according to the Koreans, the Americans never get their race mentioned in these type a comparisons, according to the Koreans. Well i personally think that samsung got sacred from the new ipad. But apple is frightened of microsoft because the next ipad is coming late this year. Apple is showing that they are worried that microsoft is gonna own the tablet zone with the windows 8.
samsung is winner....haha...i don't know why so many people like so much the apple product. it so horrible..
My eyes dont care about the difference on resolution. 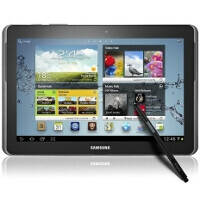 Galaxy Note will be my next tablet because of: Samsung, s-pen and of course Android. Lets face it, you could have a monster HW with an ipad... but is stil running iOS, which is crap. South Korea has never ever attacked the US. or any of its military. Samsung Galaxy Tab 11.6 Launching Tomorrow in texas 2560 x 1600 pixels Samsung Exynos 5250 processor clocked at 2GHz I see apple crying now. I would love to see Samsung put out a full sized tablet with the Note's pressure-sensitive capabilities. I'm just waiting for the price to drop a little on the Note before I pick one up.